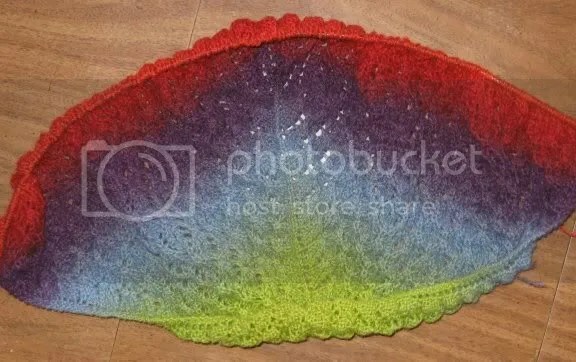 If I were going along exactly with the Swallowtail Shawl pattern I would be finished. But my incarnation would have been smaller than I wanted, so I’m still working on the inside lace pattern. I probably have about 12 rows to go before I start on the outside lace pattern. The red is already fading into orange. oh my gosh, i have to say after seeing the last post i looked up the yarn, 18$ for a skein! i love it, im looking forward to seeing more of it. you also inspired me to try a lace…something. 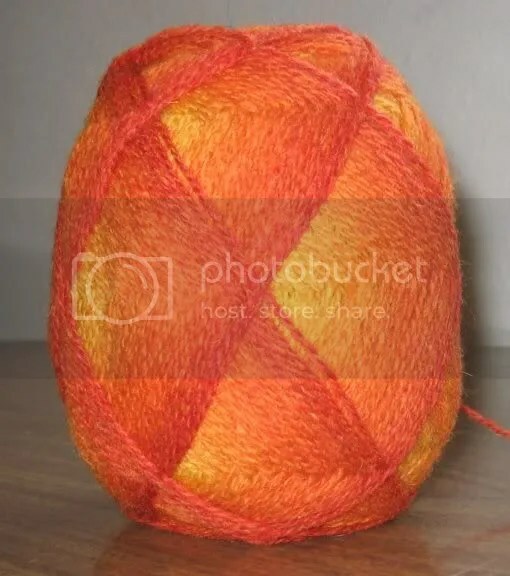 i’d like to knit something with size 7-9 needles tho, to start, i dont know how i would handle size 0-4.
keep up the good work, your stuff is amazing! I knit loosely, so just because I use a size 2 needle doesn’t mean you will. Usually I end up making gauge if I use needles at least two sizes smaller than called for. And if you like a pattern but don’t want to use small needles, modify it! I’ve seen several shawls where the maker has used a heavier weight yarn and bigger needles and they look great.